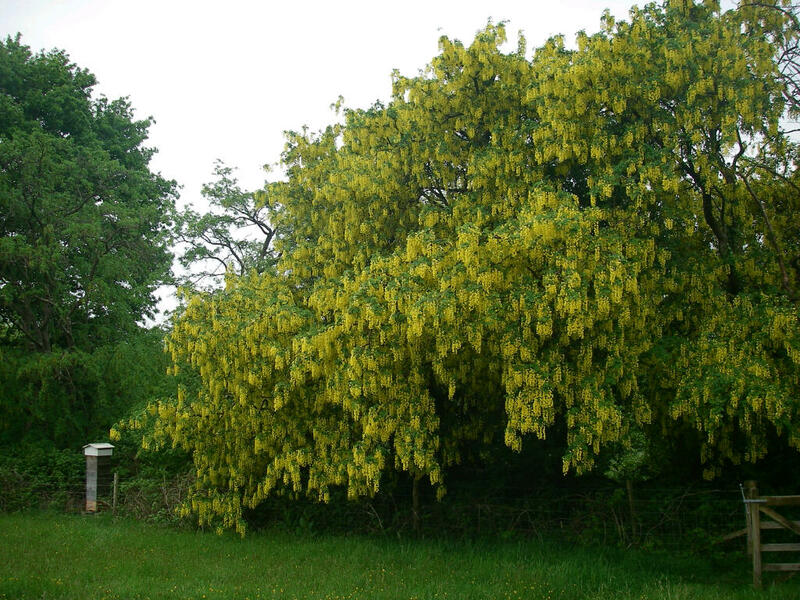 The Laburnum in the Trust hedgerows is putting on it’s glorious annual floral display at the moment, as can be seen in the picture below. A Warré beehive can be seen to the left of the picture, very conveniently placed to take advantage of the flowers! 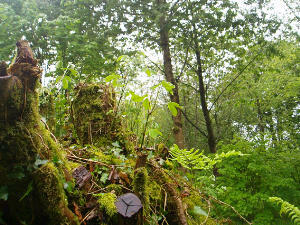 When you stand under the trees, the scent of the flowers is strong, as is the loud hum of the bees working the flowers. 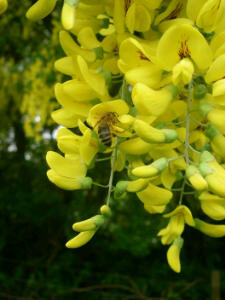 We coppiced several stools of Laburnum this autumn, (see this post). The stools are beginning to throw up some new shoots. The result of the work looks very dramatic when compared to the glorious display of the mature Laburnums, but the stools return to flower within a few years. Below is a picture of a set of Laburnum stools that were coppiced 8 years ago, which should carry on flowering for many years to come. 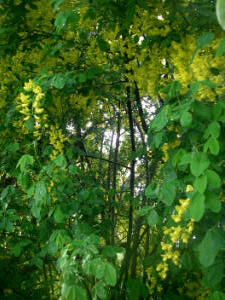 Laburnum has a reputation for being very poisonous, both to humans and livestock. We have recently discovered that this reputation may not be entirely deserved. This article on the website of the Poison Garden suggests that it is not nearly as poisonous as feared. This entry was posted in Ecology and tagged bees, coppice, flower, Laburunum, necter, poison, regeneration. Bookmark the permalink.